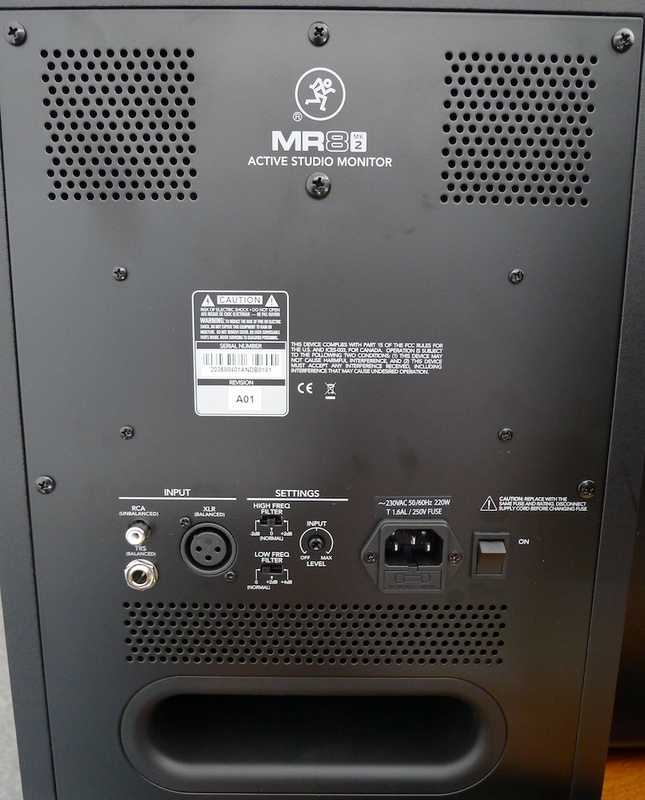 MR8mk2, Active Monitor from Mackie in the MRmk2 series. Product replaced by the Mackie MR8mk3. Mackie's speaker range is very simple and includes only two families: the higher-end HR series and the more affordable MR series. Each of the two families includes two products: a speaker with 8" woofer and another smaller model (with 5" or 6" woofer). After having revised the HR series by adding "mk2" to their name, Mackie decided to give the MR series a face-lift. We just couldn't wait to unpack the MR8 mk2. First of all, the looks of the speakers are totally new and very nice. 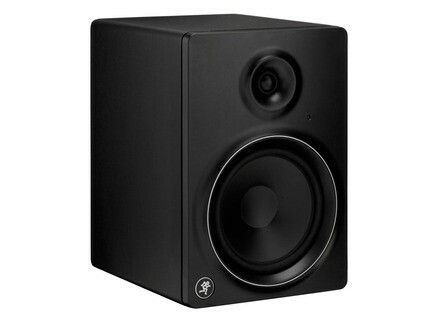 Not that the former speaker was ugly but the mk2 has a thinner and more modern design. A good point. As for weight and dimensions, the mk2 is 500 g heavier (27.56 lb.) but slightly less deep than the former model (instead of 13.78" it is 12.99" deep, which is still quite a lot). The height is still the same (15.75") while the width decreased slightly (10.9" instead of 11.81"). The MR8 mk2 is still rather bulky, especially compared to our M-Audio DSM2, also equipped with an 8" woofer. After unpacking, we also noticed that the transducers are new: 8" woofer with hyperbolic cone and silk-dome tweeter with neodymium driver. Each transducer is amplified by a class AB amplifier — 100 watts for the woofer and 50 watts for the tweeter. The 24dB/octave crossover is fixed at 3 kHz. 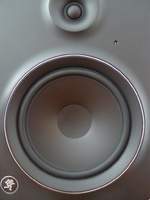 While the front panel of the speakers changed radically compared to the former version, the rear panel is very similar to the previous one, providing the same settings and connections. You get three inputs: unbalanced RCA, balanced 1/4" TRS jacks, and balanced XLR, which is very comprehensive and rare on speakers in this price range. 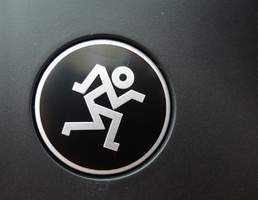 You'll also find the same disadvantage as on the former series: the volume setting is placed on the rear panel and must be adjusted with a small Phillips screw driver, which is a pity because there are more practical solutions. The same applies to the power switch that is also located on the rear panel an will force some home-studio owners to make dangerous movements or buy an adapter equipped with a switch. The rear panel also hosts the bass reflex port, which will increase considerably the amount of low-frequencies when the MR8 mk2 is placed against a wall or, even worse, in a corner of the room. Moreover, the two available filters won't allow you to attenuate the low-frequency content, but only to amplify it by 2 or 4 dB (shelving filter @ 100 Hz)! As a consequence, we recommend you to place the speaker far from the wall, otherwise you'll get an overemphasized low-frequency range and won't be able to work properly... Another shelving filter @ 5 kHz allows you to boost/cut slightly the high-frequency range (+/-2 dB). As a summary, the rear panel is rather comprehensive for a speaker in this price range. But let's listen to the speaker! We compared the MR8 mk2 with another 8" monitor speaker that is very popular on AudioFanzine: the M-Audio DSM2. Let me remind you that the latter is twice as expensive. 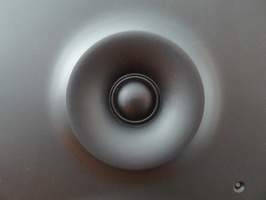 We placed the speakers in the middle of the room, at least seven feet away from the walls, to avoid the effect of acoustic amplification of the low-frequency range. Let's start with Johnny Cash's song "Hurt," written by Trent Reznor from Nine Inch Nails for the "American IV: The Man Comes Around" album. This album includes a wide range of covers and was recorded by Rick Rubin. The song consists of two movements that get louder and emphasize Cash's Martin acoustic guitar and voice. On the DSM monitor the vocals sound slightly more nasal and seem more aggressive when the tone is compressed in the middle and at the end of the song. The Mackie MR8 mk2 ensures a reliable stereo imaging and you get the feeling Cash's voice is right in front of you. As for the guitars, the balance is not the same on both monitors: you get more body and less strings with the Mackie, and viceversa. On this song, the low-mid sounds nicer and wider on the MR8 mk2, even if the difference is subtle. With a 2dB boost in the high-frequency range of the Mackie, the differences between both speakers almost disappear. But the low-mids of the MR8 still make the beautiful guitars and the piano resonate. Cash's vocals sound more pleasant as well. When the compression appears, the DSM still sounds more aggressive. For the rest of the listening session, we kept the high-frequency boost on the Mackie speakers because this setting seemed to match best the acoustics of the room. Now it's the turn of Massive Attack's "Angel," with its powerful low and ultra-low frequencies: a real crash test! Both speakers sound very similar on this song, and even more when the high-frequency boost is active on the Mackie MR8 mk2. The low-frequency reproduction is quite good with both sets of speakers. However, you'll need much more expensive monitors to feel their full power. Nevertheless, the Mackie seems to suffer a bit less and to have a better control over the powerful bass in this song. In short, the sound seems slightly more controlled. The drum kick is rather shy on both speakers, but it seems to free itself easier from the bass and has a bit more punch on the MR8 mk2. When electric guitars appear, they are a bit more precise on the Mackie, although the difference is very subtle. Too close to make a call still! Now it's time for metal with Metallica's hit "Enter Sandman" from the famous '91 Black Album. On the intro, the bass grooves a bit more on the DSM and tends to cover the multiple guitar layers. The latter sound similar on both speakers — all the time with the high-frequency boost on the Mackie. The low-frequency range is more controlled and "readable" on the MR8 mk2 although it is neither bigger nor wider. Some unwanted masking resonances appear on the DSM but not with the Mackie. On the other hand, both speakers are extremely close in the top of the frequency spectrum. Cymbals sound a bit better on the Mackie because they are less aggressive, even with the high-frequency boost. Now let's listen to Gorillaz's song with its countless details and a massive bass. The latter seems more contoured on the Mackie, with the positive effect that it masks less of the rest of the frequency spectrum. The drum kick sounds dryer on the Mackie and is a bit too long on the DSM. The voice of the rapper cuts better through the mix on the Mackie. On the guitar/vocals part, the MR8 mk2 seems to give a bit more air for Damon Albarn's voice (with the high-frequency boost engaged). Finally, let's close this song list with Miles Davis' fabulous jazz tune "Seven Steps to Heaven" from the eponymous '63 album. The ride cymbal cuts better through on the Mackie. As for the trumpet, it's more difficult to decide between either one. 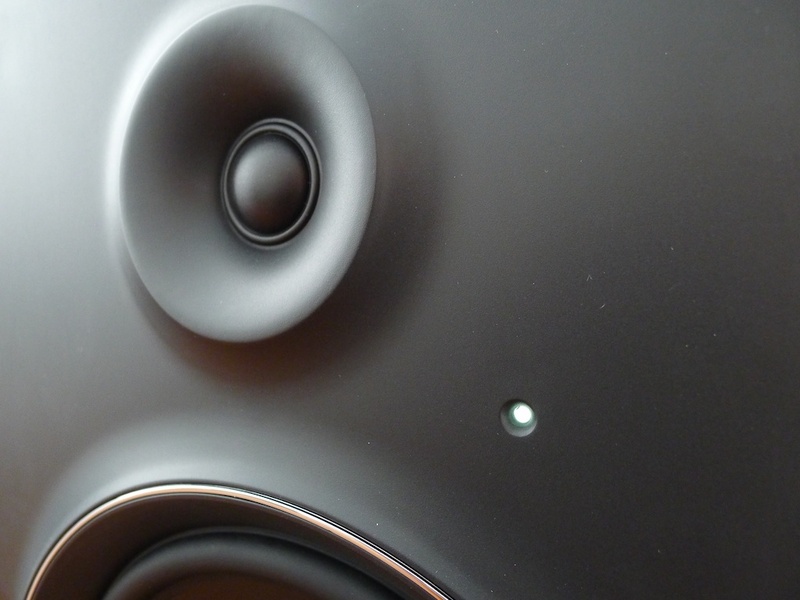 We did noticed a difference but it's impossible to say which speaker is best... The double-bass is almost identical on both speakers. Basically, this song confirms that both speakers are very close when the high-frequency boost is active on the MR8 mk2. But remember that the price is not the same! Even if the DSM2 is superior in some aspects (digitals inputs, finer settings, etc.) 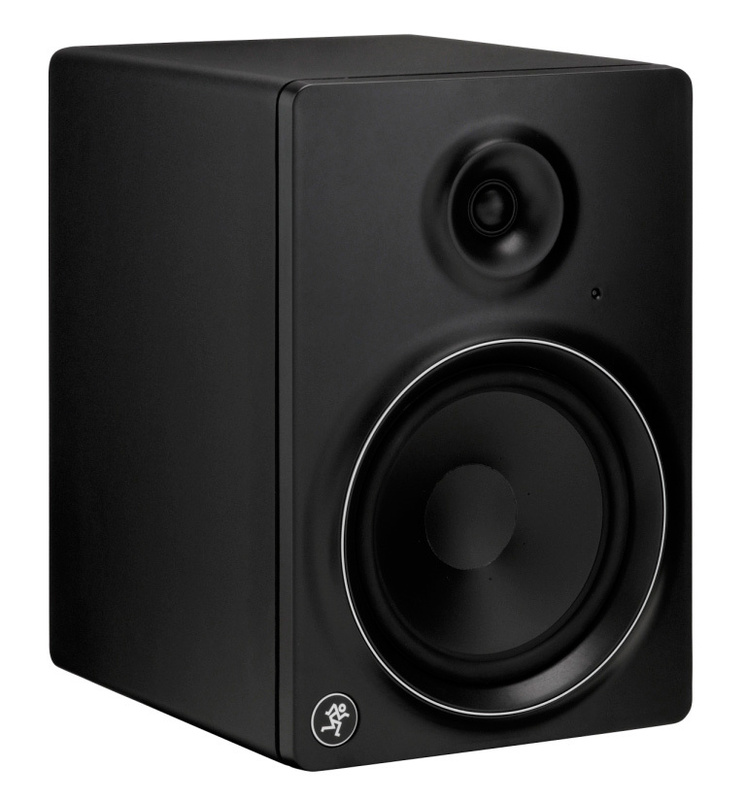 the MR8 mk2 can compete with it when it comes to sound (and for a much lower price...) Finally, we want to mention that the Mackie speakers have a rather wide sweet spot, which is a good thing. 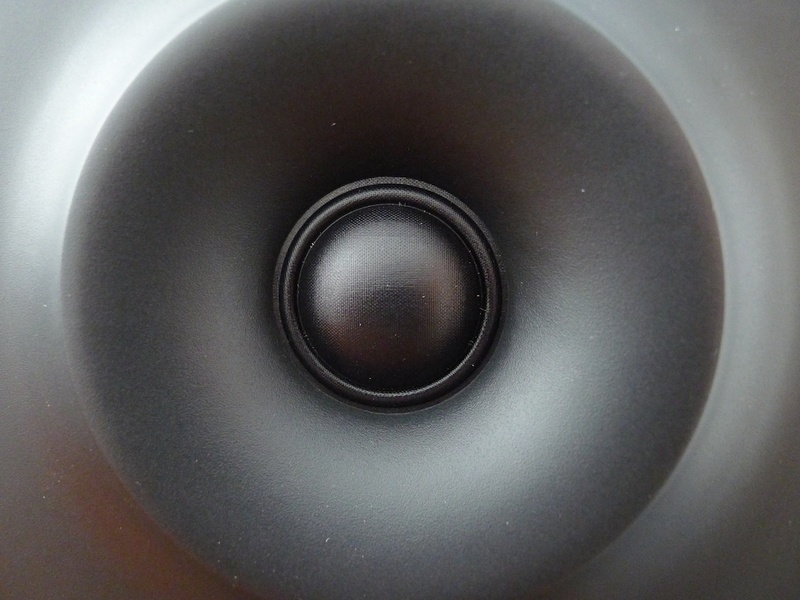 The MR8 are back with great new looks and new transducers while keeping a very attractive price (about $500/pair). The comparison with our DSM2 places the MR8 mk2 as a reference product in this price range. The sound is precise and well-balanced, the output power is more than enough and the connectivity is comprehensive. We just miss the lack of a low-cut facility. Moreover, since the bass reflex port is placed on the rear panel, the user must place the speaker carefully — otherwise the low-frequency response could be overemphasized without having the possibility of solving the problem directly on the speaker. 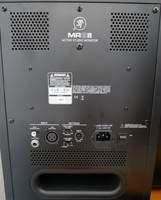 In all other aspects, the MR8 mk2 is a great deal if you have a large room and $500 on your bank account.